Actor Gerard Depardieu is in an ebullient mood as he passionately talks about his range of wines. Conducting a series of interviews at a special tasting of his reds and whites in a posh London bar, his rich, French accent proves a pleasant contrast to the cut-glass English of the capital's wine-tasting set. 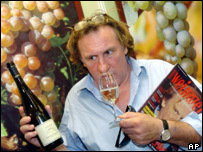 As the tasters sip, swirl and spit their way through the wines in a very serious and thoughtful manner, Mr Depardieu appears to be the lone light-hearted figure; all smiles, laughs and enthusiasm as he waxes lyrically about the wine. "For me, wine is a form of communion, and a pleasure," the 56-year-old says. "It encourages discussion and a sense of participation. Wine is a part of people and a part of life." Mr Depardieu is one of several celebrities, be they actors or singers, who have their own vineyards and make their own wine. Others include film director Francis Ford Coppola, and the singers Mick Hucknall, Sting and Sir Cliff Richard. 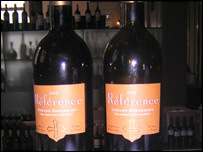 What makes Mr Depardieu different is that he has been making wine since the early 1980s. Indeed, this might explain why his looks resemble many people's idea of a contented French farmer. Never one to pander to Hollywood's demands for air-brushed body perfection, his characterful Gallic features and happily ample waistline appear to have been born to drive a tractor through a field of vines. Now producing no less than seven wines, in partnership with winemaker Bernard Magrez, Mr Depardieu has vineyards in Bordeaux, Languedoc in the south of France, as well as in Spain, Morocco and Argentina. What is certain is that Mr Depardieu doesn't have any difficulty selling his wines. In this celebrity-obsessed world, a well-known name is a strong selling point. 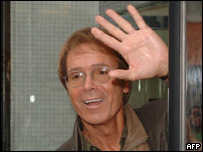 Take Sir Cliff, who has a vineyard in the Algarve in the south of Portugal. Sir Cliff's wine Vida Nova is stocked by Waitrose and is a regular sell-out. "I think celebrity certainly does help sell wine in the first instance," says wine merchant Robin Couling of London-based Novum Wines. "It definitely does help to get a product noticed in the market place. "But if a celebrity-backed wine is going to be successful in the long run, it [must] also have to taste good, or else the novelty will wear off for even the biggest fan." Mr Depardieu seems confident that his wines are up to scratch and he appears to care not one iota about his celebrity profile. "I can be happy on this earth with very little, but I like to have a lot in my glass," he says.